Use iMessage, iChat, Adium, Pidgin and other applications to communicate via your own server. Read more. 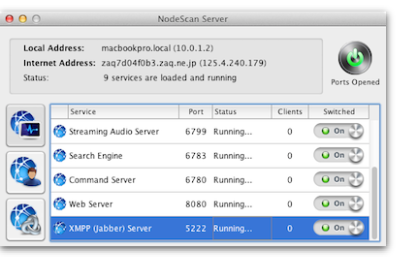 Nodescan Client is a custom built desktop application designed to make the most out of Nodescan. Download it here. Nodescan Version 1.1 (Sierra Compatible) Released on September 25, 2016. Nodescan Version 1.0 Released on September 4, 2016. No time limits and it's still free! 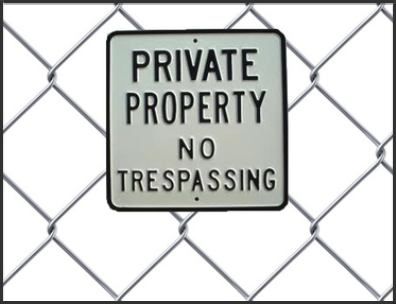 In a few minutes anyone with a broadband internet connection can set up their own server accessible to the general public or restricted to selected users. Companies can use Nodescan to collaborate and share documents both internally and externally, with their customers and clients. Design and media production agencies can use Nodescan to quickly route files among their staff and share documents for review or approval. Clubs and organizations can use Nodescan to keep their members informed, notify them of upcoming events and share photos, newsletters and videos. 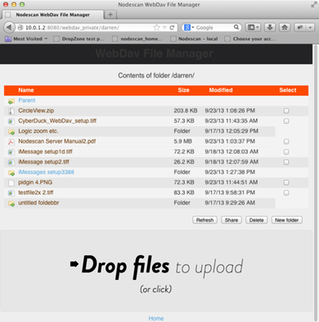 Try out the web share feature which allows files to be easily shared via your web browser. What do I need to run Nodescan applications? 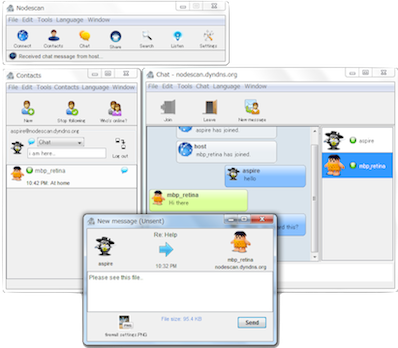 A PC or Mac running Mac OS X, Windows or Linux.